Trader Joe's is a poor man's Whole Foods. I heart it. I was introduced to this delightful grocery store by my friend Allison. She may or may not have developed a passion for "Joe" based on the selling of Two Buck Chuck. Since Trader Joe's hasn't set up shop in Alabama, I'm forced to pull in whenever I'm traveling near one. I've been known to skip national monuments in order to get a recycled bag from here. Or a cheap set of votive candles from Ikea. Mom - I wasn't purchasing any of this vile liquid. Big hug. Despite a lack of affection for beer, I'd like to chat about this policy. What's the purpose in holding people back until the PM? Since Trader Joe's opens at 8am, there are 4 hours of no beer sales. What's the point? Or better yet, what's your opinion on dry Sunday mornings? As an alcohol-drinker, and an early-service attender, I have a different view. Lots of times after I hit the early service at church, I go to the grocery store. I can get all the fixings for our Sunday Homemade Pizza Fest, or the Buffalo Wing Extravaganza, or any number of our go-to Sunday afternoon meal options. We're usually watching auto racing of some sort on Sundays, so we have "fun food" on Sunday. I mean, I get Blue Laws. I just hate having to wander around the store to check out until noon because I did not get out to pick up my six pack of Shiner Family Reunion on Saturday. I want to visit Trader Joe's. KO: I liked that full explanation. Someone might call it a vice and if so, then they shouldn't sell me Cheez-its before noon either. I have to say that this would easily morph into a heated discussion ... so, I'm admired by your "no fear". Speaking of fear (the kind that is beneficial and is to be encouraged and is a reverential awe of God) we all must work out our own salvation with fear and trembling. I like to see blue laws simply because it makes me think that this world hasn't entirely gone to the hot place in the proverbial hand basket. In other words, I can SEE the reverential awe - and I like to see that. I heard a Trader Joe's was coming to Hoover in AL! B JP: I think I have less fear because I've found most of my rabbit readers are generally laid back. I might appreciate "blue laws" more if they focused on no commerce period. Naps for all! TRP: STOP IT. This would make my year of the Rabbit! Here in Connecticut you can't buy any alcohol on Sunday so I guess I'm just used to it. I just always assumed that it was a hold over from a long time ago that never got changed. 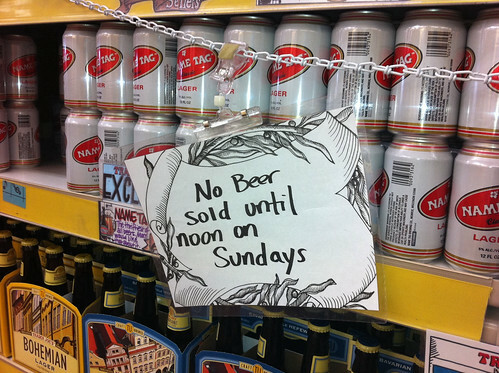 Where I live in Texas, you can't buy alcohol before noon either, but I've never seen signage like that before! C: The sign expands its fabulosity. It minimizes drunk Sunday School teachers so that you don't hear about Abraham building the ark? ?